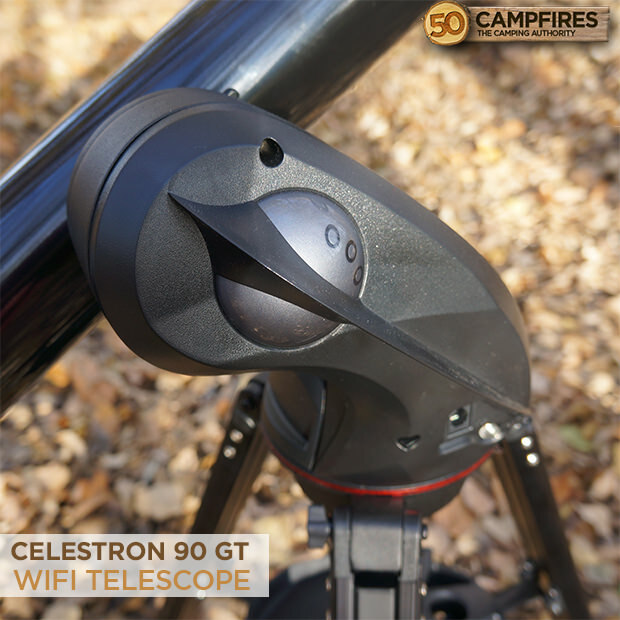 Summary : The Celestron 90GT WiFi Telescope is a great telescope for both the amateur and advanced astronomer. The app works great and kids love it! 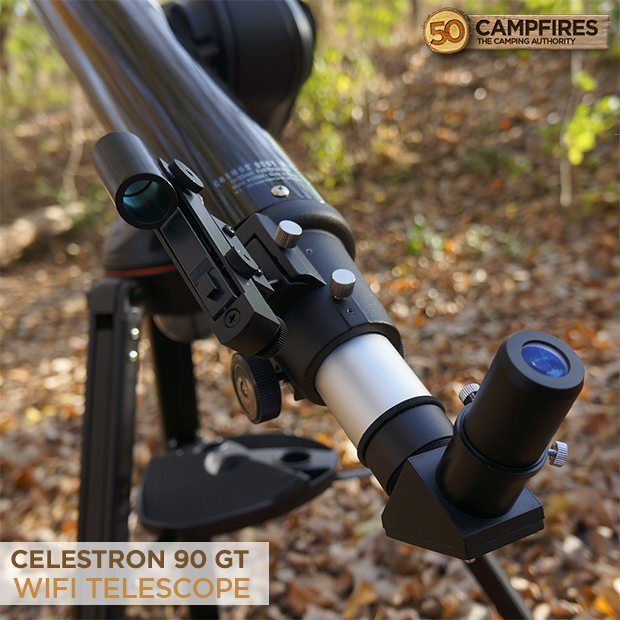 If you’re anything like us you will be absolutely amazed when the Celestron 90GT WiFi Telescope starts moving itself to the exact star you want it to go to. It feels like magic, but really it’s just the technology that’s packed in to this compact telescope. 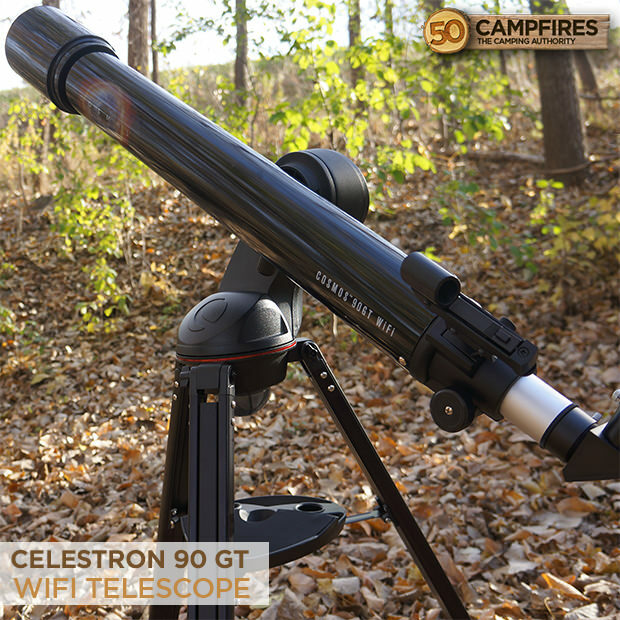 Appearance: The Celestron 90GT WiFi Telescope is a sleek telescope with a sturdy looking frame. 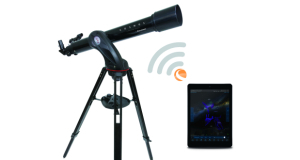 The Cosmos Telescope sits on a rotating base that moves via a WiFi connection. 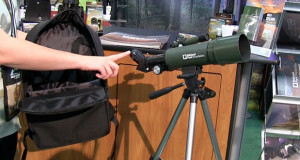 For it’s capabilities it really isn’t that large of a telescope and can break down small enough to carry along easily. The telescope is operated by a battery pack, enclosed in a leather case. Taking 8 AA batteries the telescope will run for hours. The arm that extends from the base to the telescope is heavy duty and encases the electronics to effortlessly move the telescope. 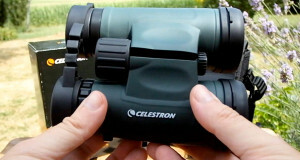 The telescope comes with the main eyepiece you’ll look through but it also has a red-dot star finderscope on the outside for sighting the scope and aiming at a distant target. Ease Of Use: We do have to say for telescope amateurs there is a slight bit of a learning curve to getting the 90T WiFi Telescope working perfectly. 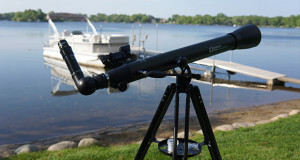 The first thing to note is that sighting in the starpointer finderscope is a must and it works better in the daylight. 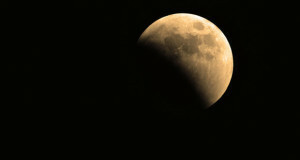 Once you have done that, the aligning of the telescope will become much easier. 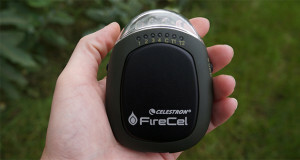 The Celestron 90GT WiFi telescope, really is easy to use. Just plug the battery pack in to port on the telescope and you have power. 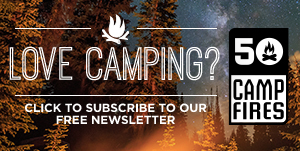 You will then connect to the WiFi network via your smartphone or tablet. One thing to note here is that it’s not a typical WiFi network where you’d still need cell service. 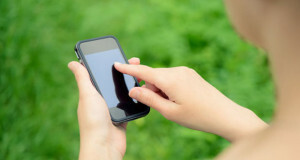 It is it’s own separate network allowing you to connect anywhere, anytime. Once you have power, it’s time to alight the 90GT telescope. 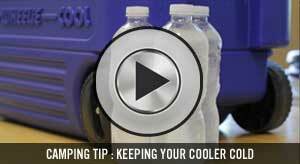 To do this you will use the awesome FREE Cosmos app that you can download in the App Store or Android Market. 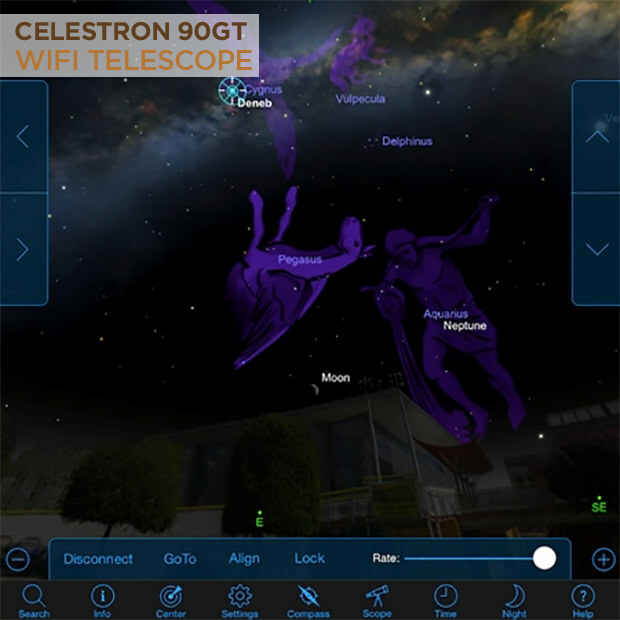 The app will give you the option to “Connect and Align.” After pushing this button find a bright star and use the red-dot starfinder scope and the arrows on the Cosmos App to move the telescope to that location. Once you have done this with 3 different stars the telescope is aligned and the real fun begins! The app allows you to put your phone up to the sky and move it around finding stars in that area. It also allows you to swipe through and find constellations, stars and galaxies. Once you have found something to explore on the app. Just push the “Go To” button and watch the telescope move itself to that exact location. 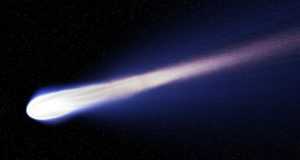 Looking at a star that is 430 light years away is pretty incredible. Durability: We’ve had this telescope out on a deck in the backyard and in the field when camping and it has held up well. The telescope has been packed in a car for hours, unloaded and set up multiple times and we haven’t seen any flaws. The entire kit weighs right around 14 pounds. It doesn’t come with a carrying case but the fact that it breaks down in multiple parts making carrying it pretty easy. 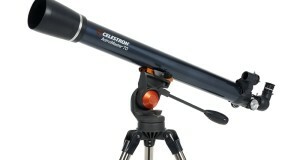 Value: At $399.95 it is a bit spendy for a first time telescope, but we think it is worth every penny. 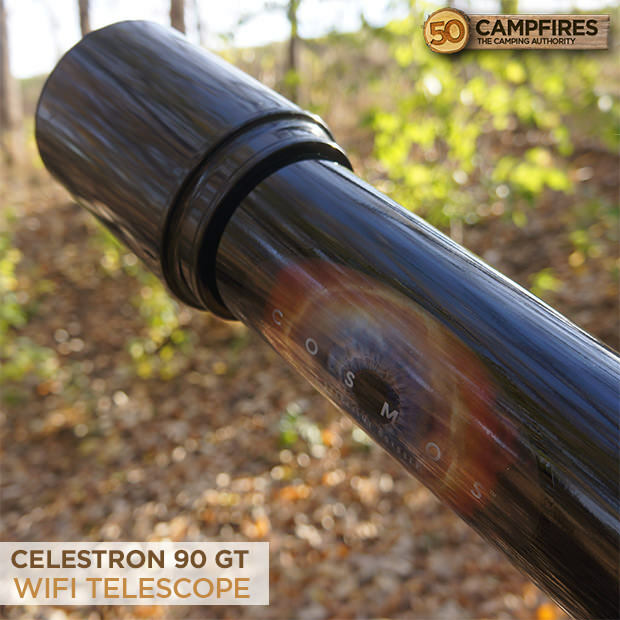 The capabilities of the Celestron 90GT WiFi Telescope are truly amazing. The free Cosmos app is mind blowing in itself. Showing all of the sky and being able to move it around in real time to see what is out there is so cool. But the real kicker is being able to push the button and watch the telescope move sideways, up and down to the exact location where you get to look through the eyepiece and witness the exact star or constellation you were looking for.